The window is too tall to fit on a 768 screen whether it is 1024 or 1366 pixels wide. 3. 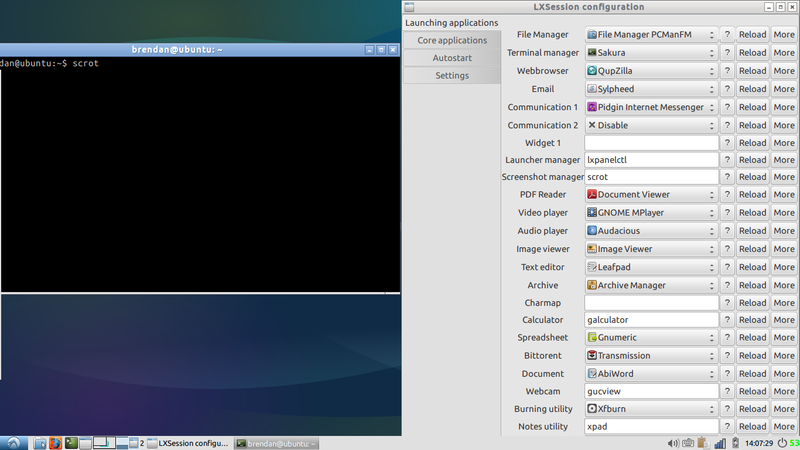 I expected to be able to view the lxseisson defualt apps application on a single 768 high monitor in resolution and be able to see the bottom line. Instead I cannot see to the bottom of the lxseisson defualt apps and on the bottom their is a line only visible if I have two monitors which I cannot normally see. This happened right after the upgrade to the new version. This also only happens on the launching applications tab. It does not fit 1366x768 for me. The problem is that the window size cannot be changed, so that the list that is too long (or too high) cannot be scrolled. The end of the list is not available. This also happens in the list for choosing defualt text editor. - Fix the size of lxsession-default-apps window (LP: #1282794). - Fix some inactive help buttons (LP: #1284497). - Fix setting auto started applications (LP: #1288115).